It’s crazy how much work actually goes into the food we eat. Unless you’ve actually tried your hand at making your own or seen the process, you’d never fully appreciate the blood, sweat, and tears that goes into a donut. As a person who doesn’t have any cooking skills whatsoever, I surely didn’t fully grasp it either until we did this volume. What’s so fascinating is the duality between cooking and baking. Beta 5 Chocolates owner and chocolatier, Adam Chandler, says that baking is like a science - you have to damn precise! This isn’t quite the case with cooking as chefs can season accordingly throughout. The fun part of Noms is learning about the amazing food scene we have here in Vancouver together. Many of the highlights we do are an extension of my own curiosity and what our community wants to know more about. With summer quickly arriving, I can’t wait to share with you what we’re investigating next! If you’ve got something you’re curious about, let me know. I’m sure you aren’t the only one. People always tell you to “follow your dreams”, but that life advice has gone mostly over everyone’s heads. Not Jordan though. He did exactly that after having a memorable dream during his travels. A successful donut shop that has got Vancouverites hooked. This is the story of Cartems Donuterie. Can you tell me about Cartems? [Jordan]: Cartems was started 2012. Our focus is on making really, really great donuts every day. We try to use local ingredients wherever we can. We choose to use organic ingredients wherever possible. We started in a small commissary kitchen with two people, and now we've got a staff of somewhere around 60 people. And three locations here in Vancouver. [Jordan]: When I was living in South Korea, I actually went to sleep and had a dream that I owned a donut shop. And it was like a really vivid, clear dream that I owned this donut shop, and we were serving fancy donuts, and everybody got a knife and a fork. And the name of the donut shop in the dream was Cartems, which is not a real word. But it was so vivid that when I woke up, I actually wrote it down on a piece of paper that I still have. I woke up and I literally I shook my partner at the time, and I was like, "Andrea, Andrea, I just had this crazy dream that I owned this donut shop, and the donuts were super fancy." So it was always this idea that stuck in my head, like on the back burner kind of a thing. And then when I was doing my masters at UVC, I'm not a huge fan of finance and accounting. I'm more into marketing and entrepreneurship. And at UVC it's very collaborative, group projects and that kind of stuff during the program, and I just kept bringing up this donut idea. And that's when I kind of realized that it was actually a pretty good idea, not just some random dream. I was looking around at Seattle and Portland, and these places already had amazing, fancy donut shops. There was a couple of them in Toronto, one in Calgary. So I realized that, "Hey, you know what? I could actually do this. I could actually make this dream a reality." The thing that kind of convinced me to do it was that in another magazine, a local magazine, they were interviewing a chef, and they were asking the chef what would you most like to see in the city of Vancouver. And I remember the chef said, "I want to see a fancy donut shop." And I was like, "Oh my god. I should do it." And that was it, totally. Why did you choose this spot in Downtown Vancouver? [Jordan]: So originally our first location was just a pop up, and it was actually at Carrol and Hastings. And it was just intended to be a temporary spot, but it was so busy we never had any time. Like if we had a day off, there was no ... nobody wanted to go look for a proper location. So we just had this little pop up. It was really, really small. And eventually we got some more help during the day, which gave us a little bit of free time to go look around for a proper location. And to be honest with you, we were just walking around this area seven years ago, and this space was empty. And all we saw was red bricks going all the way to the back, and it wasn't even a kitchen. It was like a furniture shop or like, no it was fur coats, and we looked down and we're like, "This could be a good spot for it." We love the marquee sign out front. So that was it. We were just walking around. Obviously, we weren't in a position to be opening up downtown 'cause we couldn't afford the rent. So we were trying to look for something kind of close to downtown but not downtown. And so this location really fit all the things we needed. Tell me about the donuts you make. [Jordan]: So, first and foremost, we really do, we just try to use really, really great ingredients. As far as the recipes themselves, we have our special ratio of the ingredients, but there's no special ingredient, per se. We just really choose to use the best quality ingredients we can. Over the years, and I think particularly early on, we always tried to please everybody. We always tried to say yes to everyone, which is also kind of a lesson is that you want to try to say yes to as many people as possible but not spread yourself too thin. But in doing so, we really started to come up with different recipes for vegan donuts, for donuts made without gluten. So that opened up a lot of opportunities for us to serve different segments of Vancouver. How that reflects now is we have vegan options. We have donuts that are made without gluten. Obviously, there's gluten in the building, so it's not completely gluten free, but certainly gluten friendly. We bake some of our donuts. We really try to use fresh ingredients as well, so when the summer rolls around, and farms are producing delicious berries and stone fruits, we've got access to all kinds of great fruits. And so we try to take advantage of that in the summers. As far as the flavours, themselves, go, and we do monthly specials, we kind of leave that up to the staff now. And that's where, like, the new flavour suggestions come from. So every month, the staff are the ones that are creating the new flavours for us, which is great because it kind of breaks up the monotony of the same flavours all the time. Cartems comes out with new innovative flavours quite frequently. What’s the process of that like? [Jordan]: Originally it was myself and the rest of the team that were coming up with the flavours, but now everybody's got great ideas. So now it's just a matter of flushing out those ideas and coming up with new stuff every month. It’s fun because we get to taste all of those before the month comes up and give our feedback, and so it's interesting. Oh, man. We've done everything under the sun. I remember one Thanksgiving, we put turkey inside of a donut. Yeah, and we had, like, a gravy glaze, and there was also cranberry in with the turkey. So we made like a Thanksgiving donut one year. We've definitely pushed the envelope over the years. What is your favourite donut? [Jordan]: So my favourite all time, and I don't know if it will ever change, is the apple fritter. I really love our apple fritter, and I'm kind of picky when it comes to fritters 'cause it's a very particular type of donut. And if it's done properly, you should be making it by hand. It should have a little bit of a crispy texture on the outside, and then it should be a lot softer in the middle. You should be using fresh apples, and you kind of roll the dough and then chop it up, and you form it by hand. That's how a proper fritter should be made, and we do all of those things. And we save a little bit of the dough from the day before which adds a little bit more of the yeasty flavor to it. And we do all those things, so it's hands down my favorite donut. What kind of experience do you want customers to feel when they come to Cartems? [Jordan]: The feeling that I want or I hope that customers feel is our whole intention here is we're trying to uplift people's days. That's the whole goal. You know when you're walking down the street and you've got your head up, and somebody walking towards you has their head up, and you both say hello to each other, even though you don't know that person? Your next few steps are gonna be better steps. You're gonna feel a little bit lighter in your feet, and you're going to have a little bit of a smile on your face. That's the intention when people come in. We're really just trying to make their days a little bit better. And we do that with conversation when they come in. We try to get them to smile when they ... genuinely take care in how they're doing. And then obviously we want them to have a smile on their face when they eat the donuts, right? And that's a part of the whole experience. But the overarching goal, really, is try and make people's days better. And the donut is kind of the conduit. It's the thing that we make, and we do the best we can every day with it, and that's the thing that we ... it's the transaction that happens so that we can continue operating. We need to sell something that's really important, and, obviously, I dreamt of donuts, so that's what we do here. But the overarching goal really is to try to make people's days better. A dessert that is somehow light and airy yet rich and satisfying at the same time, cream puffs are one of the finest pastries in the world. While the classic version is made with vanilla cream filling, it’s a versatile pastry that can be paired with nearly any flavour filling and topping – sweet or savoury. When you’re talking about cream puffs in Vancouver, Beta5 Chocolates is THE brand that every person thinks of immediately. 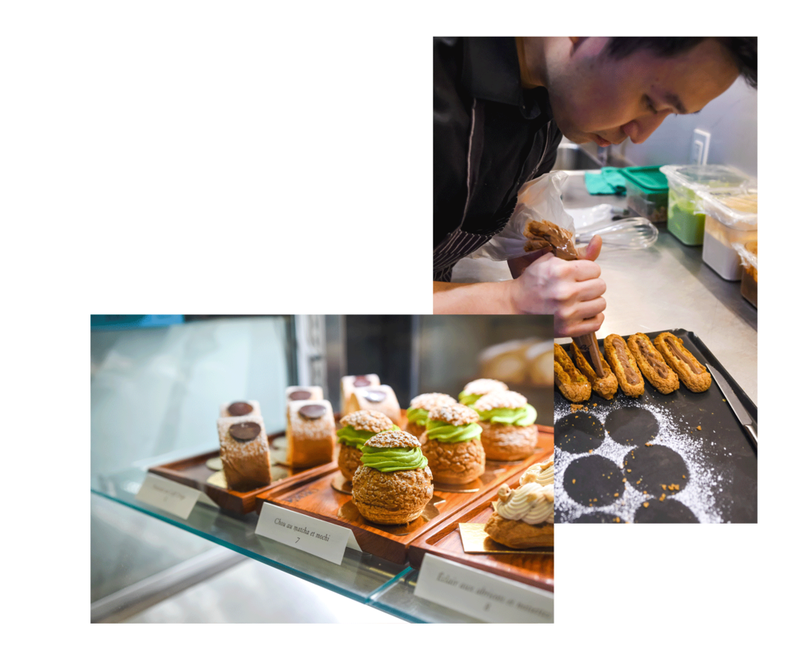 Although they started their business with chocolates, their cream puffs have become a crowd favourite for its delicate and sweet taste and inventive flavours. Can you tell us about yourself and Beta 5 Chocolates? [Adam]: So my name's Adam Chandler, I'm the owner and executive pastry chief of Beta 5 Chocolates. Beta 5 is a concept that we developed back in 2011, opened October 2011. Started initially just selling chocolate. My background is sort of in all aspects of the food service industry from production bakeries, through to five star hotels in the pastry kitchen. The name is derived from the coco butter crystal structure, so coco butter's a special fat, it's considered to be a polymorphic fat that can crystallize in a number of different forms and the form 5 beta crystal structure is the most stable form of crystallization that gives the chocolate its shine and the snap when you break it open. I kind of connected with chocolate initially through the science of it, that's how I got comfortable working with it. So wanted to reference some of that science in the name when were conceptualizing the brand. Creampuffs are now synonymous with Beta 5. How and why did you start making creampuffs? [Adam]: Chocolate is a very seasonal business. When we first started we were open one day a week. It was just myself and my wife. We needed something that I could do a fair amount of production on my own and supply the store, but in going through one full year of operation we noticed the sort of ebbs and flows of the business and felt like we needed something to stabilize things throughout the year. With my background being much more broad than just chocolate, we figure that there were a lot of other opportunity that we could to, to leverage, to create a product that might have more consistent demand throughout the year. Cupcakes were sort of a big thing at the time, I've never been into cupcakes, never been into macaroons really, wanted to do something a little bit different but we felt the cream puff was ... it was a fun approachable dessert but it also gave us a lot of opportunity for creativity. We could do a lot with flavor, do a lot with sort of design and garnish, and so we just thought it was something different that wasn't really being done anywhere in Vancouver to any great extent. So when we first launched them there were, I think, six flavors. We also were going croissants and cookies and it was just sort of testing a bunch of different things to see what would kind of stick. Eventually it was the cream puffs that stuck for us, they were easy to manage from a production perspective, really well received by the customers. We managed to stabilize the business a little bit more with them, so we kind of went for it and went all in on the cream puff. Pastry is nice in that it gives you the creative outlet but also it’s a very precise sort of field or craft, kind of different from cooking in that sense where cooking you’re just seasoning to taste, here we can’t add butter or sugar or flour to taste. They’re all very specifically calibrated recipes to make sure that we get the final result that we’re looking for. How would you describe a GREAT creampuff? [Adam]: I think it's got to be fresh. I think it has to be made the same day. It's such a simple thing but it's all about the textures, right? You want to maintain a relatively crisp shell, nice soft creamy fillings. We try to play with two or three different textures, at least, in each cream puff, just makes it a little bit more interesting to eat. So you're not just having this cream puff shell and then it's full of cream, it's sort of a very one dimensional kind of experience. If we can get something sort of light and airy like a whipped cream, something a little bit more dense like a custard, and then maybe some cake in there as well to go against the crisp texture of the shell, it's now becoming something that's a lot more interesting to eat than the more basic version. Can you tell me about the Variations of Chocolate creampuff? [Adam]: When we were initially developing the menu, there's always sort of like key flavors that you want to include to cover all of your bases, right? Vanilla, caramel, chocolate, and then some fruit options. The chocolate cream puff has been on the menu in some way shape or form since the very beginning, six years ago. The one that we do now, the Variations of Chocolate has kind of evolved over the last three years to what its become. We wanted to do something that was sort of showcasing a variety of different flavours and textures of chocolate. 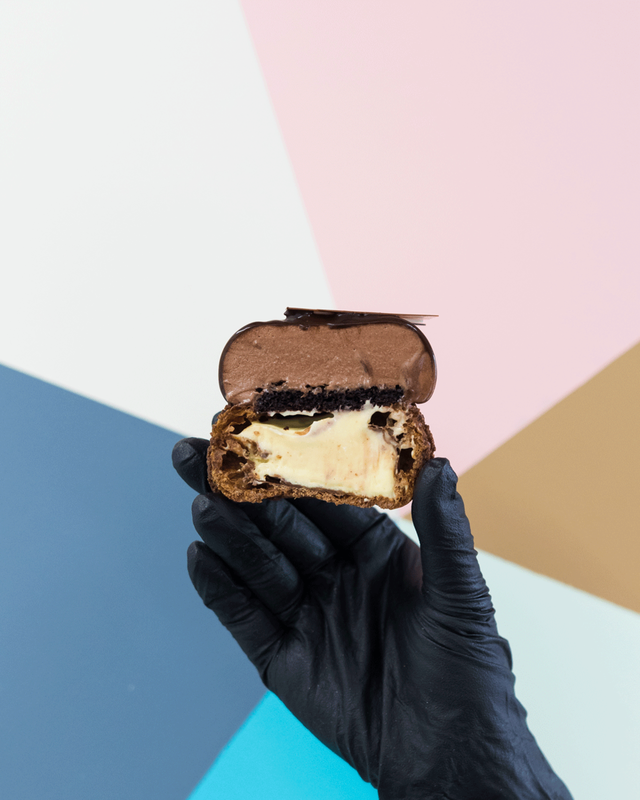 We have the chocolate shoe that's flavoured with coco powder, we've got the coco nib custard which is basically just a cream that's been infused with coco nibs so you keep that sort of creamier or ivory coloured custard that tastes really intensely of coco. It's kind of like a bit of a trick in that you've got this white cream that tastes like chocolate mould. Then there's the chocolate cake, then the chocolate mousse, the chocolate glaze, the pieces of chocolate as a garnish. We really wanted to explore every- all of the different flavours and textures that we could potentially include in referencing the chocolate. So that's why we call it Variations of Chocolate. It's not just, this is our dark chocolate cream puff, this is us playing with a bunch of different types of chocolate and component parts of chocolate, the coco and coco nibs to create something that we feel is a little bit more unique, a little bit more interesting to eat than something that would just be straight chocolate. Beta 5 is quite known for your creative flavours. Like the recent Mango Bubble Tea cruffin. Tell me about how you come up with these. [Adam]: Cream puffs, we've always changed flavors seasonally. The mango bubble tea thing started with ice cream socials. I don't remember how we got to it, but being in Vancouver we're surrounded by great food from a number of different cultures. A lot of it coming from Asia, so we're very influenced by that, especially being on the Pacific Coast. Just seeing what was sort of going on in the city and eating ourselves and those are the sort of flavours that I go for when I'm wanting to eat out. It just seemed like a fun thing to try, making a sundae with a mango sorbet, a milk tea ice cream, a couple of pieces of toasted milk bread that are buttered and covered with condensed milk, and then some bubble tea pearls. It was just sort of like an idea that we had that we thought would be fun. The first day we sold it we sold out super quick. We had no idea it was gonna be as popular as it was. And it's just been something that we've gone and tried to iterate on in a number of different ways. We've done a mango bubble tea cream puff that comes back periodically depending on the season. We did a similar flavour profile for a chocolate, we do the ice cream sundaes. A lot of it is just playing and trying new things and seeing interesting stuff going on in the city from a food perspective, recognizing the cultural influences that surround us, and then trying to create something that feels very unique to Vancouver. I guess it's kind of of fusion sort of idea where we're taking things from different cultures and blending them together to make them feel like something that's unique to us here. I guess that's where a lot of it comes from. Sometimes we decide that we want to tell a specific story and we'll go down that path and try to explore all of the different flavour opportunities in telling that story. So there's a bunch of different ways that we kind of come at it. Asia’s Leading Fitness Youtuber launches a no nonsense LIVE workout app, FIO, to get you sweating and in shape. I am Joanna Soh and I am Asia’s Leading Fitness YouTuber. I started my channel 6 years ago and at present my channel has over 1.5 million subscribers with over 130 millions views. I am a certified Personal Trainer (ACE), Nutrition Coach and Women’s Fitness Specialist (NASM). With over 9 years of fitness experience, I strongly believe that leading a happy, healthy and balanced life starts from within. I create everything from home workout videos, to simple, delicious recipes, meal preps, workout plan as well as nutritional tips. Believe it or not, I’ve created more than 400 videos! It’s been an extremely fulfilling journey for myself knowing that my videos are reaching out and changing lives across the world. I have viewers from America to the UK, Malaysia, India, Philippines, Singapore, Australia, Canada and more. I am also the creator and founder of Fio, a leading and growing fitness app in Asia. Why did you decide to create FIO? I believe that looking after yourself starts from home. Hence, why I started my YouTube channel. I wanted to make fitness accessible and easy for everybody, no matter where you are. You can workout from home, at the gym or even at work. I also believe that healthy eating habits start from home. However, with my YouTube channel, I was only able to upload videos once a week. With FIO, my mission is get my audience active, driven and motivated every single day with fun, engaging and effective workouts. Users will get access to full length workout classes every single day, ranging from high intensity circuit to strength training, bodyweight cardio, kickboxing, yoga, pilates, mobility work and more. These classes are suitable for all fitness levels. So no matter what your starting point is or what your fitness goals are, there are classes catered for you. What makes FIO different from other fitness apps? The coaches and I will be working out “live” with you just like a class. We feel your burn while pushing you and keeping you motivated. No voice overs, looping a workout or funky editing! They are GENUINE, NO NONSENSE & RAW! Our top hit is the #fiodailychallenge where we challenge the users to perform a 1-minute exercise every day. Users upload and share the video onto Instagram, and we reward them with amazing prizes every month. The response has been incredible so far and it has been so inspiring to watch people from across the globe connecting with the same vision of improving themselves through the #fiodailychallenge. On top of that, you also get to choose customised workout programmes, ranging from one week to a month long. You also have access to super easy, quick and healthy recipes to support you through your fitness journey. How would you suggest a beginner to use FIO? Start by joining in our daily workout classes to get moving, as well as our #fiodailychallenge. There are monthly prizes to be won to keep you motivated! Get connected with the Fio community by supporting each other through your fitness journey. Looking to kickstart your fitness journey? Try out Joanna’s fitness app, Fio, and follow along her Live daily workouts. Beginner friendly and advanced workouts available! Move every day no matter how little time you have. It can be extremely overwhelming if you think that you have to prep all your meals every single day. Take it one step at a time and start by prepping just one meal to begin with. That can either be having breakfast at home or cooking dinner after work. Slowly add on another meal once you feel that you can manage. It is all about taking one positive step at a time. I believe that you NEED to have fun. Yes, we want to achieve results. Aside from just focusing on the goal, what is even more important is the journey of getting there. Make your journey fun and learn through it. Pick the types of workout you enjoy, discover more about your habits and maybe even pick up new cooking skills - you’d be surprised with what you’re capable of. Our city is filled with plenty of exceptional local cafes that not only serve up a delicious cup of coffee, but top notch baked goods as well. When you can find a cafe filled with both talented baristas and bakers, the combination is too delicious to avoid. If indulging in pastries is wrong, we don’t want to be right. Bakery owner Delainy established The Gluten Free Epicurean after losing two family members to food allergies. This drove her to help others by adapting recipes that everyone could indulge in regardless of sensitivities. Delainy has her own food allergies and says that every item originates from her own cravings that she then to adapts for herself. Turns out a lot of people relate to her cravings too! The bakery also offers options that are dairy free, nut free, refined sugar free, grain free, soy free, paleo and vegan. Drop in and try their daily quiches made with fresh seasonal ingredients or one of their bestsellers: the salted oat cookie, AKA the Goldilocks of cookies; decadent and crunchy, with the right amount of saltiness and sweet. For breakfast, lunch, or your next coffee break, indulging at Small Victory Bakery is never the wrong choice. The expertise of their bakers is apparent, not only in the most complex pastries served, but in the foundational items essential to any Parisian bakery - bread and croissants. Their fluffy and crisp in-house bread, and selection of buttery, flakey croissants are all the rage. Plus, if a bakery has a solid selection of sandwiches and fresh bread baked daily, that’s usually a good sign. You may recognize this place from their Instagrammable kawaii Totoro cookies and artistic interiors. If you think this place blew up from social media, you’d be mistaken. Liberty Bakery has been a neighbourhood institution in Mount pleasant for almost 19 years. One of the original owners was a Swedish baker and the recent owners (that took over in 2015) are local artists. The fusion of the owners’ backgrounds display their love of art and homage to their Scandinavian heritage. Their pastries fuse standout quality ingredients, and European technique. Some of their most notable items are their croissants, chocolate chip cookies, and of course, their Totoro shaped gingerbread cookies. Pair any with a solid cup of coffee from local roasters, Elysian coffee or their in-house hot chocolate. Walking into Purebread is pure bliss. It’s a wonderland experience that makes every adult feel like a wide eyed child in a candy store. Their owners began by baking at home for their family to baking for farmer's markets, before growing to their 5 locations in BC. None of their baking contains additives, and none of our breads contain sugar. Purebread constantly creates new additions inspired by changing trends and seasons. They just brought back one of their favourites for the spring, an apricot vanilla bean scone; chunks of apricots, creamy white chocolate and delicate vanilla bean. Alongside their regular items, they have a variety of specialty items each week. Temper Chocolate & Pastry Owner and chef, Steven Hodge is a big fish in the culinary world. He has worked at various renown establishments like: Wolfgang Puck’s Spago, Gordon Ramsay’s Royal Hospital Road, Thomas Haas, and Global Group. With a resume like that, it’s clear that he knows his stuff. We asked him about his favourite spots around Vancouver to grab brunch, dinner, and a drink. My favourite brunch place is at home because we love hosting and making a day out of it. Breakfast is my favourite meal and I feel like Vancouver’s breakfast places are lacking. My favourite place for dinner is Nook on Denman, because it is delicious, consistent, classic and great cozy atmosphere. I order the burrata appie and then the salad and a salami pizza. And of course, Italian wine to pair. My favourite place to drink is the Feast restaurant West Vancouver, love to go there in the summer and sit on the patio. I order a white negroni to start and then a dirty martini. The amount of food spots in Toronto can be quite overwhelming considering how much bigger the city is compared to Vancouver. If you’re making your way to the 6ix for a short getaway, you’ll want to make sure to hit up the right spots. We asked popular Toronto food blogger, Foodie.Fob, for his brunch and dinner recommendations. The first Japanese Soufflé Pancake in Canada called Hanabusa Café captured social media attention when it first opened. They are very jiggly fluffy! I love the fact that Hanabusa provides seasonal flavors like the recent Rose Lychee Pancake for February 2019. My go to would be the custard pancake. It is like eating Crème Brulee and pancake in one go. Who said dessert for brunch would be a bad idea! East Coast Canada provides some of the best lobsters. One restaurant that fully utilizes lobsters at its best would be Fishman Lobster Clubhouse. The Hong Kong “Bay Fung Tong” deep fried lobster featured in many social media is the main attraction and it is garlicky delicious. Recently we ordered 6 lobsters @ 52lbs shared among 18 foodies and everyone was well fed. Just beware it can be messy. This restaurant allows BYOB as well. There are many bars and restaurants where you can find yourself a drink in Toronto. The one that I think stands out among the rest is Barchef. I often call it the gastronomy experience or Picasso for cocktails. Owners Breant Vander Veen and Frankie Solarik love to play around with human senses to give you the full drinking experience. I would go for the Modernist Cocktails such as Essence of Fall or Vanilla Hickory Smoked Manhattan. Toronto being a multicultural city, this is where it shines. Every summer, Toronto offers many cultural food festivals so that we can learn its culture through food. From Chinese Night Market to Taste of Danforth (Greek) for example, you can feast all day. I attended the Taco Fest back in 2018 when Mexico won the 1st game in the World Cup. It was a fun day as you can devour many types of tacos, listen to mariachis and drink tequilas. When you think about Montreal, items like poutine, smoked beef, and killer brunch comes to mind. But that’s not all this city has to offer. We asked Physicist, food writer and food tour guide, Randomcusine on his top Montreal food recommendations. If you’re looking for an original and creative brunch spot, Le Butterblume is your best bet. Chefs and owners come from big name restaurants - Olive et Gourmando, Pâtisserie Rhubarbe, Bouillon Bilk and Pullman. Anything that you order is beautifully composed, full of flavours and simply tasty. My top picks: cauliflower cake with espelette pepper syrup, foie gras mousse toast with lemon & Juniper berries sauce, and German raviolis “maultaschen” with chicken dashi and onion confit. Want a memorable dining experience? Go to Cantine Teré (previously called Fieldstone). Chef Chanthy Yen is a creative food science genius. He worked at some of the top 10 restaurants in the world including El Bulli and Mugaritz. Combined with the Mexican roots of his business partner Emiliano Rivera, they blend Mexican and Cambodian influences plus prestigious experience into their food. Ready to be amazed by their unique flavour combinations and unconventional techniques, and make room for their foie gras ice cream with charcoal meringue shards. Forget about store-bought chai, get the true and authentic taste of chai at Bristol Chai. Here it is brewed for 45 minutes in milk to extract all the flavours of the spices and tea leaves. They have concocted six chai recipes ranging to the classic Masala chai (Arthur), to smokey, to floral. Every day, 3 chais are on offer infused in different types of milk. Paired your chai with their homemade pastries ranging from cannelés, far breton, scones and more. You can book your experience on AirBNB experience with Victor (Taste of Chinatown with a Food Writer). On his food tour, you will sample food from five regions of China and walk around the largest grocery store to help you familiarize with staple ingredients used in Asian cuisine. Sometimes you just stumble onto what you’re passionate about. Sometimes it isn’t planned. This was the case for Remi Ho, ex-pastry chef of Origo Club and owner of Remi Patissere. We caught up with the pastry wizard to hear his story. Can you tell us about yourself and how you decided to be a pastry chef? [Remi]: My name is Remi Ho, I'm the Pastry Chef at Origo Club. I'm born in French Guiana. It's a small country off of Brazil, South America. It's in the middle of the Amazonian forest, so it's a third world country. Basically, the food scene is not amazing over there. It's good, but it's not amazing, it's not international. I didn't start loving the food industry until I came to Canada. My parents wanted a better education for the kids, so when I came here about the age of grade eight age, I went to high school here, and after high school I just wanted a summer job, so I took a summer job at Tapenade Bistro, in Steveston. It's a small French bistro, and I was just a dishwasher there. And slowly I fell in love with the hecticness, and the busy environment of the kitchen. 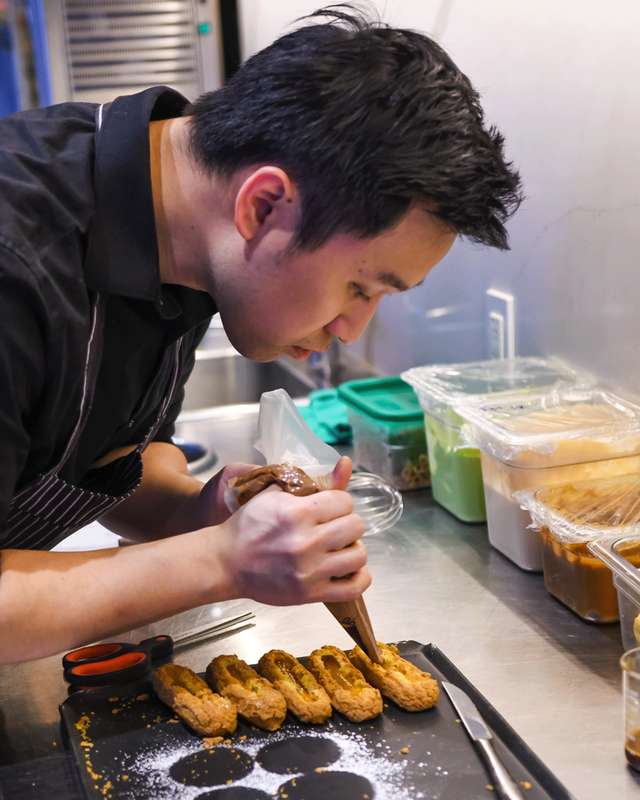 Under the wings of Alex Tung, the head chef back then at Tapenade Bistro, I learned a lot through him. He mentored me, and then now he's like my very good friend, mentor. So, that's how I fell in love with this industry. And after high school, after Tapenade I went to Cioppino, Secret Location, and Chez Christophe. At Chez Christophe, was where I learned the most in pastries because it's a Swiss bakery. So, over there I was a Sous Chef for three years, and slowly my skills was polished in the pastry techniques. So, I felt I just stumble into this industry by mistake. Because I didn't know about food that much. I didn't care about it so much, but I got that passion in it because I loved the kitchen, working in the kitchen, and I liked touching food and I liked seeing customers happy. So, this is what pushed me to be a pastry chef. Tell me about the pastries here at Origo Club. [Remi]: The techniques are French, but I wanted to bring the pastries of France into an Asian community, so I needed to tweak it a little bit. I need to change it, I need to make it more light and less sweet, and but still keeping the French tradition and the mind behind each pastries. At Origo, I make this Matcha Mochi cream puff. The result: it's light, creamy, and very loved by this community and Asian people. Also I have this flan. It's a French pastry where on the outside, it’s crispy, light parfait, very creamy cheese center. This is something that I love eating when I was a kid. It's a French pastry, but I added a touch of lightness to it for this community, and who doesn't like cheesecake? But cheesecake's always very heavy, very dense. So, I married it with this flan, which is a super light, sort of creamy in the center, but with a very flaky tart shells. So, this is a type of pastries that we make at Origo. I felt I just stumble into this industry by mistake. [Remi]: When I travel around the world, for example, when I go to Japan, or when I go to Italy, when I go to France, the food that I eat at these places around the world give me inspiration. When I taste something, I try to recreate here with that memory, and I try to put my twist in it as well. So, traveling is my place for inspiration. What do you think Vancouver does well? What do you think Vancouver needs to work on? [Remi]: I think Vancouver does well in choosing very specialized ingredients. Specifically, bakers in town does really well about choosing the right ingredients for health conscious. We know that wheat is an issue nowadays because they have a lot of pesticide in it from growing these wheats, and GMO wheat stocks. But in Vancouver, we have all of these bakers that are very conscious about this and they would go to find specific farms, smaller farms, smaller growers that have very good ingredients, very great flours, and use that in their baking. It's a lot more work because you have to go directly to the farmers and it's more money because it's a smaller farms. But Vancouver has the ability to use these ingredients, and I think that's really great. I think where Vancouver needs to work on is, we're always a step behind the bigger cities, like Tokyo, New York, Hong Kong. Because these cities h\have a lot more population and there's a lot more competition between the bakeries, and they try to innovate all the time. And I think Vancouver needs to learn from that. We need to keep pushing ourself to create things that haven't been done before. Where in the world do you think has the most exciting food at the moment? [Remi]: I think the most exciting place to be right now for food and pastries in general I would say it's in Japan, Tokyo. We all know that the Japanese are perfectionists. They will take the techniques, hone it and they make it their own and they perfect it. And I think being in Japan, being in Asia, you have all these great exotic food, exotic ingredients. And they have the resources, the technique, the brain to make it, to elevate the pastries. So, I think right now in Asia in general, it's the best place to be for food. There are people who like matcha and then there are people like recipe developer Sift & Simmer, who make you think of them every time you see the popular green tea. Although her matcha recipes and photos make everyone go wild, we got to hear a bit more of how she started her journey. I’m Michelle, and I’m a recipe developer and food photographer for my blog Sift & Simmer. I live in Vancouver with my husband and 2 young boys, who are my steadfast taste testers and are the reason why I started blogging in the first place. How did you get started with developing recipes? I started developing recipes because my boys, especially my eldest, are very picky eaters. In an effort to get them to eat more, I really had to put on my thinking hat and create unique recipes that would appeal to their tastes. I also am quite conscientious about the food that we consume so I only opt for organic, all-natural ingredients in all my cooking and baking. In a sense, I enjoy the challenge of creating something different and delicious. What is it about Matcha that fascinates you? I didn’t always have a love affair with matcha. To be honest, my first time I had matcha, I didn’t like it. I thought it was bitter, grassy, and kinda gross. I never gave it much thought afterward. I gave matcha another shot many years later and discovered it was earthy, complex, but delightfully pleasant. That’s when my interest in matcha piqued and I started experimenting with it. The many health benefits to consuming matcha is just a big awesome bonus. Can you tell us a story where you had to learn a specific baking or recipe developing trick the hard way? While I was developing the recipe for my Homemade Aburi Sushi – I quickly learnt that it’s important to have the correct tools. At the time, I didn’t have a blowtorch, and the only way to emulate the “torched” look was to use a butane lighter (you know, the ones that you use for lighting a campfire)… Yeah, it took a pathetically long time to “torch” the aburi. I ordered a blowtorch off Amazon and re-did it – suffice to say, it only took seconds before the aburi was blackened. Lesson: get the right tools!! What’s your favourite dish to cook? And least favourite? My favourite dish to cook is my Instant Pot Vietnamese Beef Pho. It’s relatively quick to make and is my husband’s ultimate favourite. I can always count on my kids to slurp their noodles and finish every drop of soup. My least favourite dish to cook is anything that needs to be grilled – I leave that all to my husband. He does all the grilling for me. Is there anyone who inspired you to begin cooking when you were growing up? What about now? Yes, absolutely! My Mom is the one who inspired me to cook and still inspires me today – she thinks of the most amazing recipes and is completely self-taught. Growing up, she cooked every single meal for our family. She instilled in me the importance of knowing what’s in my food, my passion for cooking and baking from scratch, and sharing that love of food with family and friends. In a medium bowl, cream together softened butter and powdered sugar with a spatula or hand mixer until smooth. Add the egg yolk and vanilla extract and mix until combined. Mix in the flour until the dough becomes smooth and no pockets of dry flour remain. Form the dough into a flattened disc and wrap in plastic wrap. Chill in the fridge for at least 1 hour or overnight. When ready to use, let the dough sit at room temperature for 10 minutes. Roll dough out to about ¼ inch thick and 1-2 inches larger than your tart pan. Press the dough into all the ridges of the tart pan and trim off excess. Keep chilled in the fridge while you prepare the filling. In a small pot, heat cream cheese and heavy cream on low-medium heat. Whisk until all the cream cheese has melted and no lumps remain. With a fine mesh sieve, sift powdered sugar, matcha powder, and cornstarch into the cheese mixture and whisk until smooth. While constantly whisking, add in the egg and vanilla extract. Keep whisking until the mixture is thickens to a custard consistency. Pour the filling into the tart shell and smooth the top with a spatula. Whisk together the egg yolk and water to create an egg wash and gently brush the crust and surface of the filling. Bake the tart for 30-35 minutes or until the centre of the tart has set. Increase temperature to 400°F and bake for an additional 3-5 minutes until crust is golden brown. Let the tart cool completely on a wire rack before releasing from the tart pan. Optional: Pipe whipped cream and matcha whipped cream on top if desired. Gail is a food photographer and blogger in Vancouver with an infinity for desserts. Her blog, Teak & Thyme, which launched Summer 2018, chronicles her foodie travel guides, weekend baking, and other sweet recipes. 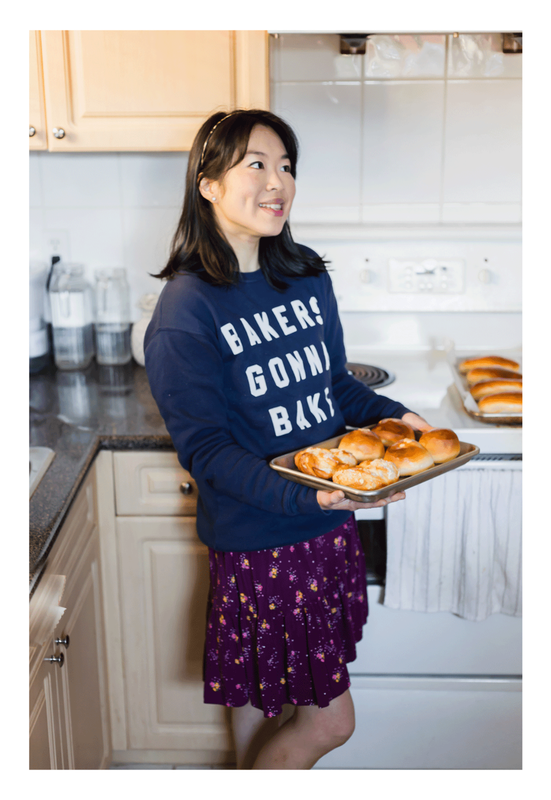 Her photography passion began much earlier than that, as a creative calling throughout university that eventually merged with her love of food.